Strawberry Milkshake Recipes aren’t all alike. Fans have their preferences for how the delectable treat is made. Some like them thick and icy. Others prefer a thinner, milkier milkshake. Any way you like them, the taste of a rich, creamy, fruity, Strawberry Milkshake. When the term ‘milkshake’ first came to be known, it was as a whiskey based drink, similar to eggnog. (There are some who might wish it never changed.) That was in the late 1800’s. By the early 1900’s the milkshake had taken on its more common form. Still, it seems like they were more similar to chocolate, strawberry and vanilla milks. They were commonly made from milk flavored by syrup. 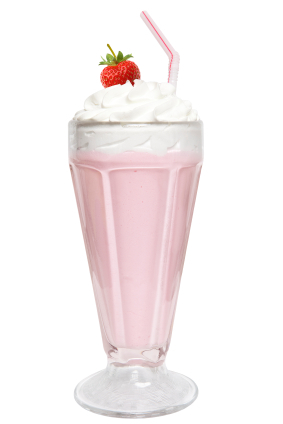 By the 1930’s, malt shops were preparing a Strawberry Milkshake made with ice cream. These malt shops became the hangouts of their days. This propelled milkshakes to their current popularity. The popularity and availability of milkshakes grew. This was thanks to the invention and availability of an important piece of equipment. Without the milkshake drink mixer, milkshake popularity may have faded. 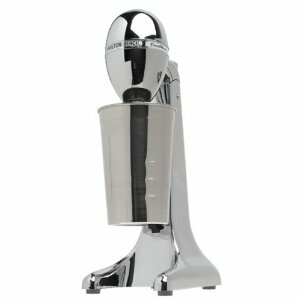 Hamilton Beach was one of the earliest makers of milkshake drink mixers. It still remains a popular choice today. The classic look of the stainless steel cup and long blending rod have become symbolic of the malt shop and milkshakes and remain the most common drink mixers today. Chains such as Friendly’s still have a line of the clean stainless steel mixing cups lined up, ready to blend a fresh milkshake in. These popular Hamilton Beach Strawberry Milkshake Mixers are available for well under $50 today. This makes them an affordable addition to the average homeowner or apartment dweller. They are especially affordable once you realize how much a homemade Strawberry Milkshake can save you. One of the secrets to making a good Strawberry Milkshake is the key selling point to milkshake drink mixers. The spindle on the machine ends in a blending head that ‘fluffs’ the milkshake by infusing it with air. This fluffing action makes a large milkshake out of a smaller amount of ingredients, making milkshakes a very profitable item for most restaurants. A 2006 study found that nearly 75% of the average selling price of Strawberry Milkshakes was being kept by restaurants as profits. That means making shakes at home can save you a LOT of money. One of the newest ways to enjoy Strawberry Milkshakes is to add unique flavors, candies and other products to the milkshake. Adding such items as strawberry liqueurs, strawberry candies or even jams to your Strawberry Milkshake give it new and unique tastes. Pour milk into blender. Set to low speed. Add ice cream carefully to avoid splashing. Add confectioners’ sugar, vanilla extract and strawberry topping. Increase speed to high and blend 15 seconds. Pour Strawberry Milkshake into glass and top with Reddi-Wip, and garnish with strawberry slices. Mix first two ingredients (milk first) in a blender. Turn blender on low speed. Carefully add ice cream to prevent splashing. Turn off blender. Add frozen strawberries and increase to high speed and blend for 15 seconds. Pour into glass and garnish with whipped topping and fresh strawberry. Place sliced strawberries, sugar and vanilla extract in a bowl, mix well, and let sit for 20-60 minutes to blend the flavors. Add ice cream and milk and blend with a mixer until smooth (or blend in a blender). Pour into tall glasses and garnish with a fresh strawberry.